Accessibility: What are the Most Important Issues to Fix? Siteimprove is a full-featured web accessibility management service available to all Cornell faculty and staff at the main Ithaca campus, Weill Cornell Medicine, and Cornell Tech. The Siteimprove platform is a simple, powerful tool that evaluates how accessible your website is, and shows you how to make it better. Licensing for this enterprise service is currently funded by CIT, University Relations, the Division of Human Resources, and Weill Cornell Medicine. 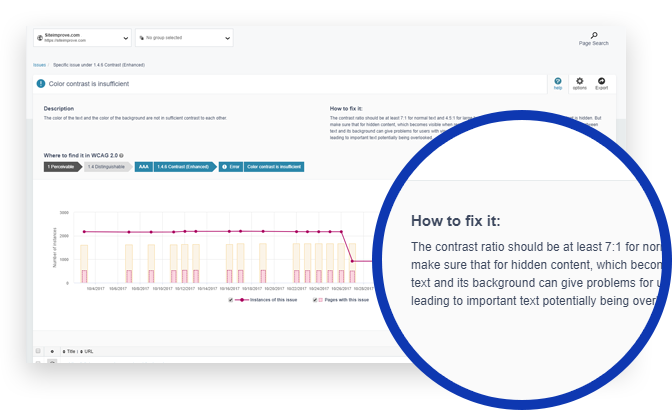 Siteimprove offers a key approach to securing digital accessibility for public websites, with an at-a-glance dashboard feature that pinpoints exactly where to make improvements. The service provides complete visibility across your content quality and performance. Accessible web design is central to good design principles, and following guidelines for web accessibility ensures usability for everyone, including people with disabilities. Use is restricted to staff and faculty for websites related to official university business, or in support of the university mission. The service is not for personal use. Students and people with sponsored NetIDs who contribute to Cornell-affiliated websites may be granted access to Siteimprove with the sponsorship of a full-time staff or faculty member. The sponsoring staff/faculty member should have their own Siteimprove account, including the relevant site(s), prior to adding the sponsored user. Siteimprove is available for public sites only. It cannot be used for secured or locked down websites. Accessibility: Fix non-accessible headings, images, links, or forms. Quality Assurance: Find broken links, misspellings, and view an inventory of your content. Policy: Set guidelines for your website's content, images, and documents. Search Engine Optimization (SEO): Make sure your intended audience can find your pages. 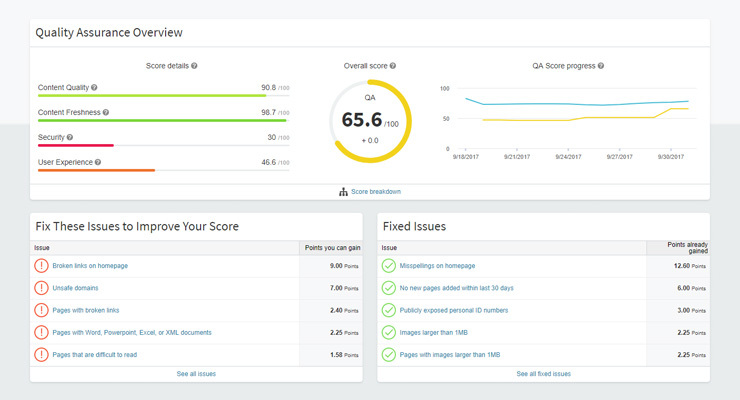 Reports: Track your progress or schedule reports on issues that Siteimprove found. When scanning PDFs, Siteimprove is limited to file sizes of 15MB or fewer. 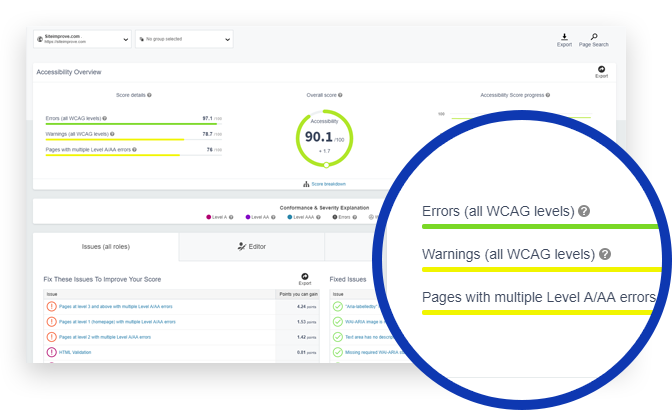 For more information about PDFs, see the tutorial on how to improve PDF accessibility (Siteimprove login required) or the PDF remediation checklist. To see a complete list of PDFs and determine if any went unscanned, go to Quality Assurance > Inventory > Documents > PDF. Need help making your website more accessible, including manual testing and enhancement? Siteimprove is a self-service application. If you prefer to hire expert assistance, contact the Custom Development team. For more information about web accessibility compliance and manual testing, see Cornell's Web Accessibility resources. Directions for how to setup a new account in Siteimprove and get access to an existing website. This is common if you are new to a group or department, or recently changed jobs. If you already have a Siteimprove account but need to add more websites. How to review the internal and external documents (PDF, Word, etc.) on your website using Siteimprove. How to add external documents to your Siteimprove crawl.